54th Street preserves some very old streetscape to go with its old houses. Both of these water-main lids are on the same block. The Contra Costa Water Company was Anthony Chabot’s baby, founded in 1866. That was the company that built the two dams at Lake Temescal and Lake Chabot Reservoir. It got involved in Oakland’s nasty “water war” during the 1890s. In short, Chabot’s company turned down William Dingee’s request to extend water service to his properties in Montclair and Piedmont, and in 1893 Dingee formed the Oakland Water Company in response, tapping wells in upper Shepherd Canyon. The competition grew heated, then ugly. Mutual disparagement escalated to mutual accusations of sabotage. Customers of both companies suffered poor service. In 1898 the two firms were obliged to merge, with Dingee in charge under his former rival’s name. 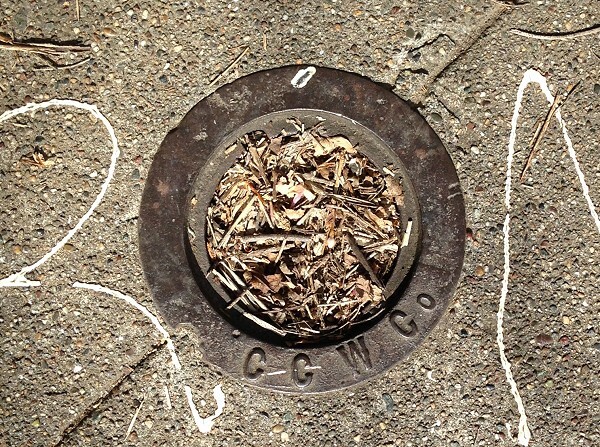 Less than a decade later, the People’s Water Company devoured the Contra Costa Water Company. I think this lid used hardware from both People’s and Oakland water companies, perhaps a fresh cap in an old ring or just mixed inventory in the People’s warehouse. 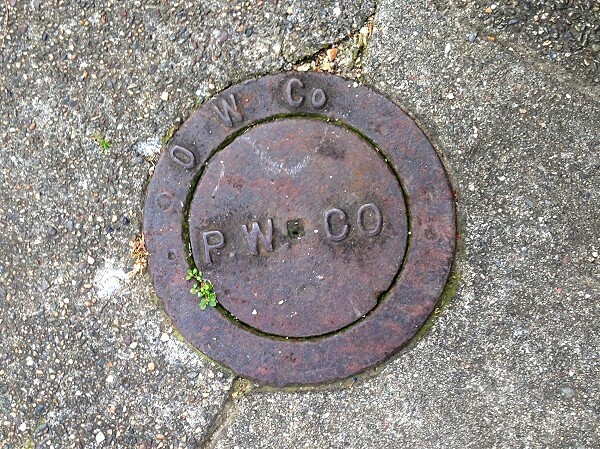 People’s Water Company collapsed within a decade, too, with the short-lived East Bay Water Company springing from its wreckage. Only after the East Bay Municipal Utility Company was formed did Oakland get good, reliable water service. Remember the water wars whenever someone tells you private enterprise can do everything better and cheaper. This entry was posted on 9 March 2017 at 8:03 am and is filed under Streetscape. You can follow any responses to this entry through the RSS 2.0 feed. You can skip to the end and leave a response. Pinging is currently not allowed.